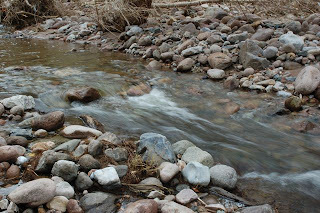 You know the drill -- play along at Wordless Wednesday! I was lucky enough to be included in another fun toy party with a product that is *just* released to market. 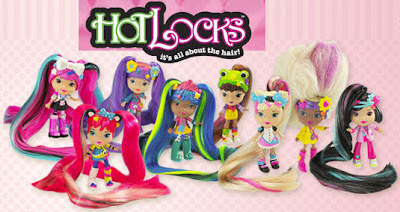 This time, I received a box of Hot Locks dolls to check out and share with our local buddies. Lydia will be 3 next month, and she loves baby dolls and Barbies already, so I thought these might be a fun addition to her collection. For a girl who hates having her hair brushed, these dolls have been great! They have very long hair, and come with a comb and other accessories. Lydia has had a great time combing and playing with their hair, and I've been successful in brushing her hair when I hand her her doll so she can brush the doll's hair at the same time. For that alone, I was happy with these dolls! We had the chance to share them with others this weekend, and I was interested to see what other girls would think. 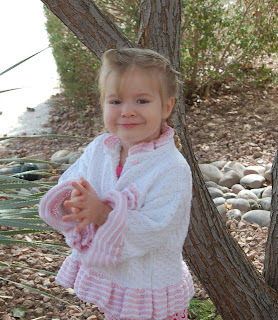 We had a variety of ages -- Lydia was the youngest at 35 months and the oldest was 9yo. All the girls thought the dolls were tons of fun. In mere moments, they had the dolls out of the packaging (and the packaging was easy to get into -- no hermetically sealed and sewed and taped and tied dolls here!) and were playing with the hair. The long, silky, colorful hair! The hair quickly gets messy, but isn't that true of all dolls? The girls didn't seem to mind! They stayed busy combing, placing barrettes, and trying out the styling chair that made braiding easy. One of the dolls even came with a flat iron which placed jewels in the dolls' hair. 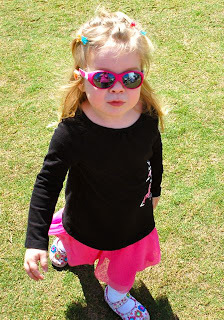 The moms were a bit taken aback by one doll - - Harlow -- who looked like she was wearing fishnet stockings. More than one mom joked "Is her name Harlot?" Nobody felt the fishnet stockings were appropriate for a girl's doll. The dolls are smaller than a Barbie. Their hair is brightly colored, and their clothes are brightly colored as well. 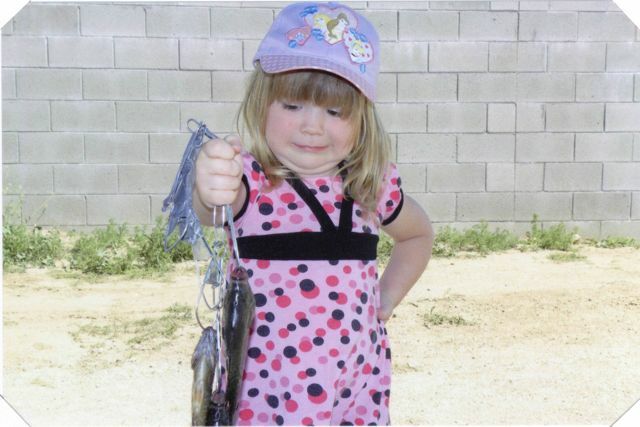 The wide set eyes reminded Lydia of the commercials she saw recently for Sprout's new show - Dirt Girl - so she has taken to calling the red-headed Ryann doll her "Dirt Girl." The regular dolls have 14" of hair to play with, the deluxe dolls have twice that amount. The dolls have been released only in the Phoenix and Chicago markets, but I'm sure they'll spread across the country soon. Visit Wowee's website for all the details and to see where they are available. 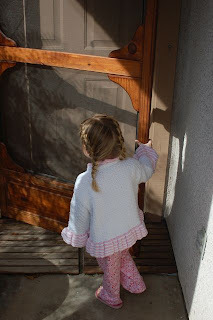 They are a big hit at our house, and if you have young girls, I'm sure you'll find them living in your house soon! Disclosure: To facilitate this review, I received a party pack of dolls for my daughter, and to give away to guests from Mom Select and Wowee Toys at no cost to me. All opinions and statements are my own. Are you wondering what to make for your Easter celebration? I realized that it's THIS Sunday and I still don't know what we're having to eat. I checked out Safeway and Betty Crocker's "Bake Sweet Memories" site and was inspired by some of the adorable treats featured. Not only will you find the adorable "Easy Bunny Cake," but you'll also find some great coupons to help you save money this spring. My sister's nickname is Bunny, so I think this is the cake we need to have this year! Until April 6th, you can purchase Betty Crocker SuperMoist Cake and Traditional Brownie Mixes at the special price of $0.69 at all the Safeway family of stores. This is an awesome deal -- made even better if you happen to have any coupons! When you visit Bake Sweet Memories, you'll be able to load exclusive Betty Crocker baking coupons onto your Safeway loyalty card. Thanks to My Blog Spark, Betty Crocker, and Safeway, I have a great baking package to give away to one of my readers. 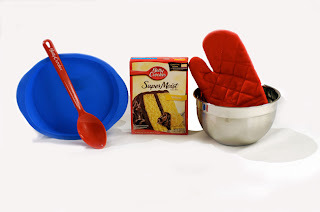 This package includes a 9 1/2 inch silicone pan, a red Betty Crocker spoon, a really nice metal mixing bowl, a red oven mitt and a $25 gift card to Safeway! In order to enter, you must visit the Bake Sweet Memories site and let me know one of the recipes you want to try (or just looks really cute!) The winner will be drawn Easter Sunday (April 4, 2010), so enter by midnight on April 3, 2010. You can earn extra entries by sharing this post with your social media network -- either Twitter, Facebook or your own blog. Each share is worth one entry. Disclosure: Safeway and Betty Crocker provided me with a VIP coupon for Betty Crocker brownie mix, the information, and prize packs for myself and to give away through MyBlogSpark. I was happy to choose a winner for this week's Disney on Ice performance! Cynthia was the lucky winner, and is excited to take her boys later this week. If you didn't win, I'm sorry . 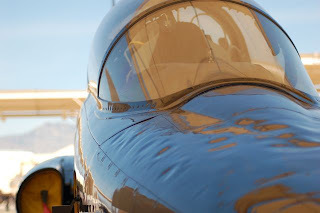 . . but there are still those amazing discount codes available for the shows on April 1 - 4, 2010! I talked with a friend last week whose husband bought tickets as a surprise (but paid more than he could have with these discount codes!) If you use the code "MOM" at Ticketmaster.com, you can receive 4 tickets for $44. Any additional tickets will be only $11. This discount code is not valid for VIP or Front Row seating. I"m sure there are a few great seats still available, and it's bound to be an awesome show! Come back later in the week to hear all about the show! Lydia doesn't know we're going, so I can't wait to share her reaction! 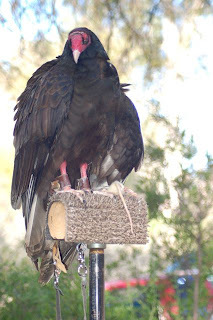 Link up your Wordless Wednesday post! Wait a day and share your story on Tell Me Thursday! Keeping with our goal this year to explore more of Arizona, we spent a fun day in Tucson this past weekend. Bo taught a class there on Friday, and we originally planned to drive down with him and make a weekend of it. Unfortunately, between spring break and spring training, we were unable to find a non-smoking hotel room that would fit the 5 of us. 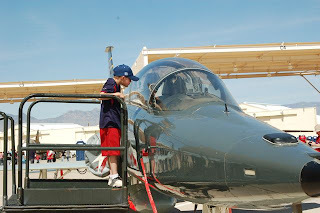 We were going to put off a Tucson trip for a few weeks, but Bo noticed that the Air Show at the Davis-Monthan Air Force base was last weekend, We decided to drive back on Sunday to visit the show. 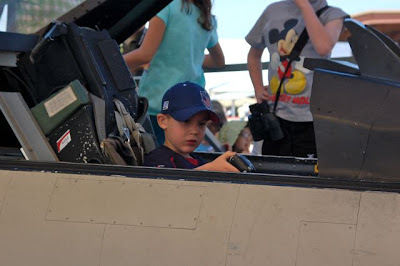 We saw many airplanes on the ground, and Nate loved the chance to look at the planes up close, as well as watch them fly through the sky. Colin was a bit bored, and Lydia was tired. She hasn't used a stroller in well over a year, but I think she would have gladly sat in one on Sunday. (It had been a busy weekend -- planting on Friday, Boyce on Saturday, then a long visit at a friend's house in the afternoon / evening.) For a long time I kept an umbrella stroller in the back of the van, and I think I should throw it back in the van. I'm glad we went for Nate. He has expressed an interest in the Air Force for a few years now, and would like to attend the Air Force Academy. 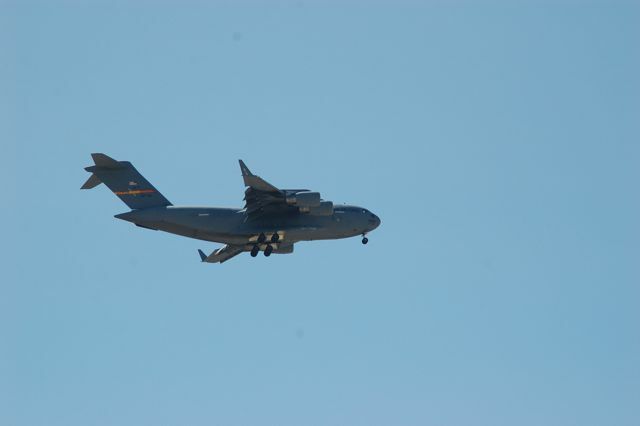 He was able to talk to a few pilots who went through the Academy, and they were encouraging and kind. After a few hours on the tarmac, we headed to Eegee's. Eegee's is a fast food place unique to Tucson where they have delicious frozen fruit drinks and subs (as well as other things -- like pizza fries, which are fries topped with pizza sauce and mozzarella cheese) When Bo worked for Sears, he would sometimes have calls in Tucson and usually brought back Eegee's. The flavor of the month was lime, and it was yummy! The rest of the family enjoyed a mix of strawberry and lemon ice. 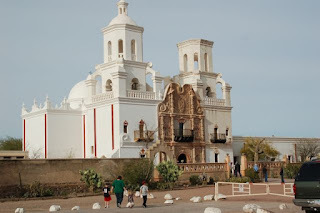 We finished up the day by visiting the San Xavier Mission. It was founded in the late 1600's, and has been there ever since. 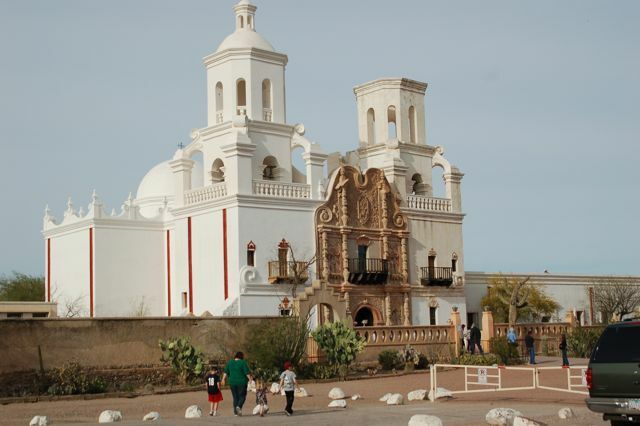 It's a beautiful, old church that is the oldest European structure in Arizona. 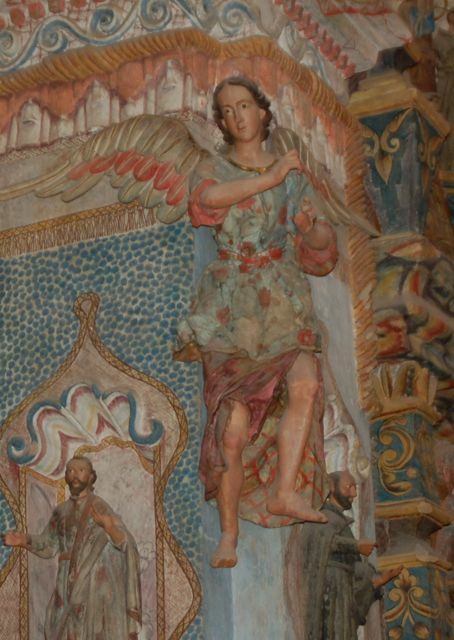 It is a fully operating parish, but is also open daily for tourists to visit. There are a few things I should have done to make this trip better. I should have been better prepared to throw together a cooler of drinks and food to take with us. Instead, we purchased drink & foods along the way. I should have had a stroller for Lydia, because even though she is almost 3 and still fiercely independent, there are days that she needs a rest. I also should have put my shawl back in my purse so she could have had a covering when she tried to rest on my lap / the ground during the air show. I am glad that even though our original plan was scrapped, we still made it away from home to do some exploring this weekend. I'm not sure where we plan to go next month, but I'll let you know! I've been second guessing myself ever since the reporter left a couple days ago. While I hope I sounded intelligent and shared my ideas in a thoughtful, careful manner . . . I know that I have no control over how things will be edited and what pieces will be used. The interview was thrown at me a few hours before they showed up at my door, and I was given a couple lines about the focus of the piece. While I know I can't go back in time and change things, I just hope it's obvious that I'm trying my best. And with that, I'm going to try and stop thinking about it until the piece airs! 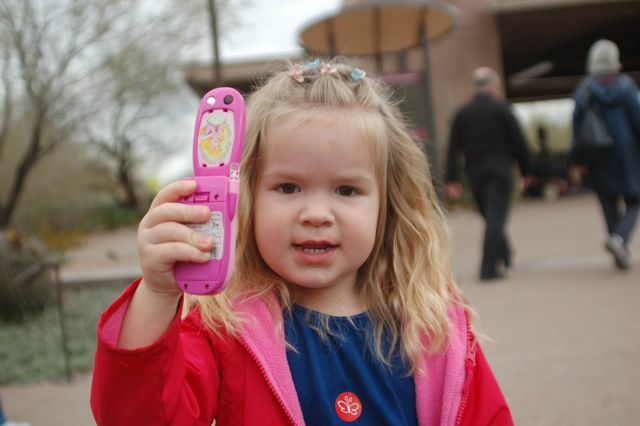 My Wordless Wednesday shot was of Lydia, taking a picture with her princess phone. She can't leave home without her purse and her phone, and will make me wait until she finds her phone some days. She likes to flip it open and call her Aunt Bunny, or her grandparents, or sometimes Uncle Matt. Every once in a while, even Mrs. C or Mrs. J receive a phone call when she wants to check up on their children. She will shush us if we try to talk while she's having a conversation, and she sometimes will even turn away so she can have her conversation in private. It's very cute to watch . . . even if it is like looking in a mirror! Did you play Wordless Wednesday yesterday? Don't forget to tell your story and link it up at Tell Me Thursday! Every year, for the past who knows how many, I have made corned beef and boiled potatoes and soda bread for St. Patrick's Day. Some years, I've made cabbage, but I really don't like the smell of cabbage, so the last few years I skipped cabbage. Every year, everyone mentions how corned beef is a "once a year" thing and it's not really anyone's favorite. In fact, it's just tolerated. Dinner was delicious and everyone enjoyed it! I used my slow cooker, which meant that even though I scrambled to get ready for my TV interview, dinner was cooked and ready when we were. Soda bread mixes up quickly so it wasn't a big deal to make it right before we ate. Another tradition left behind . . . and some days? That's a good thing! This morning, as I was throwing together beef stew for tonight's dinner, I received an email asking if I would be available to have a TV crew come to my home and interview me about safe baby/child products. I took a deep breath . . . looked around my house . . . and replied "Sure!" Before they showed up, I shot this video to help me think about the products I was showing, and let go of some of my nervousness. I realized I mis-spoke a couple times in my home video and hope I did better when the reporter was here. The Lotus Bebe blankets are made from soybeans and BAMBOO. I don't know why I said flannel, except that they are softer than flannel! A few hours later, a very nice reporter and his cameraman showed up and we talked about being a mom, choosing products with little to no chemicals, writing a blog, my Frigidaire refrigerator (he was a bit incredulous that I received it in exchange for blogging . . . and I am, too, sometimes! But I also know that I helped spread the word about the brand and showed my readers how it really worked in our home!) and then I talked about some of the products we had in our home. I'm curious to see how the show is edited and how excited Lydia will be to see herself on TV. She still complains that she wasn't able to be on the last show (when I was live on Sonoran Living) so I'm glad she got her shot this time! I'm also hoping I didn't say anything dumb. The kids were all well-behaved . . . well, as well-behaved as 3 children their ages can be, I guess! 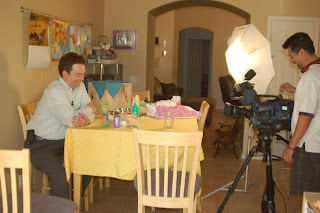 Here's Keith Yaskin, the reporter for Fox 10 News, with his camerman getting some final shots in my kitchen before they left. I'll let you know when the episode airs -- I'm especially curious what others have to say about avoiding chemicals! My boys used to enjoy watching Handy Manny, and Lydia (2yo) does as well! It's a fun show about teamwork, building and fixing things! What's not to like? Lydia likes it because she loves to help fix things, and with 2 older brothers and a handy Daddy, there's always plenty to fix around here! This Saturday, March 20, 2010, Handy Manny Big Race is airing for the first time. It's a Disney Family Night Special Event, and will air 7PM/6PM CST on the Disney Channel. Handy Manny is going to fix cars and race in a big race for this show! I'm sure all his tools will be there as well to help him out. You can visit the Handy Manny Pit Stop Shop to play fun games, and even find recipes that would be fun to go along with the show. When I was writing this post, Lydia heard Handy Manny's voice and came running over to check out her "favorite game!" We stopped and played the game where she could decorate her own car, and she had a great time adding flames and lots of colors to a race car. Disclosure: I wrote this review while participating in a blog campaign by Mom Central on behalf of Playhouse Disney. Mom Central sent me a gift card to thank me for taking the time to participate. 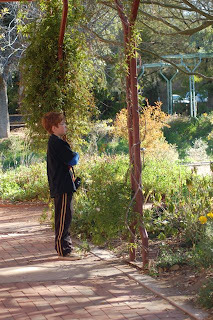 You can play along by linking up at Wordless Wednesday. Wait until tomorrow to tell your story by linking up to Tell Me Thursday! We were given passes to an early preview of How To Train Your Dragon, so Bo & the kids took in the movie this evening. A few weeks ago I won tickets to The Lightning Thief, but when Bo & the boys arrived 2 hours early, all the tickets were gone. 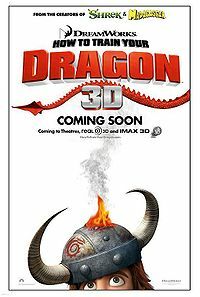 The PR firm sent us tickets to How To Train Your Dragon -- which was another one that the kids really wanted to see. I guess with the early previews, PR firms give out more than twice as many tickets as there are seats to make sure the theater is full. Tonight, Bo took the kids about 3 hours early and was able to get in! When they came home, everyone shared that they enjoyed the movie. The boys thought it was funny, and a little suspenseful in parts. Bo said that it was amusing, and had a few jokes that went over the kids' heads, but were there for adults. All felt that the animation and effects were well-done. Colin said he can't wait for the games to come out, as he's sure there will be games for the movie. Both boys said they'd like to see it again, so I'm sure I'll be able to watch it once it comes out on DVD! The movie is set for general release on March 26, 2010. My sister and I were at one of the national bookstores recently, and as she was checking out, she noticed a book near the register. The Lost City of Z: A Tale of Deadly Obsession in the Amazon (Vintage Departures) caught her eye, especially because she has an interest in visiting the Amazon. The clerk told her it was a great book, so she added it to her purchases. A few days later, she told me the book was awesome and that I had to read it, because she wanted to talk about it with somebody. But, she didn't want to give up her copy, so she'd buy me my own. She tried to buy it for my Kindle , but you can't gift Kindle books, so she decided to loan me her copy. She dropped it off, but I've become spoiled by my Kindle , so I bought it myself and downloaded it. The Lost City of Z: A Tale of Deadly Obsession in the Amazon (Vintage Departures) is one of the best books I've read in quite a while! It is fascinating and kept me turning pages as often as I could sneak a few minutes away to read. It is a non-fiction account of explorers of the Amazon, most specifically Percy Fawcett who disappeared many years ago, and all those who attempted to find him. The story moves back and forth between the early/mid 1900's and modern day. Usually, I don't like that, but David Grann made it work very well in this book. The stories of the explorers were vivid and detailed! While it didn't make me want to explore the Amazon, it did make me yearn for adventure. I actually loved how he moved between his own story of exploring the Amazon and reports of Fawcett and other explorers from the past. Grann is a great storyteller and I found myself thinking this would be a fun read aloud for the boys! If you're looking for an interesting story, full of factual events you may never have heard about, I highly recommend The Lost City of Z: A Tale of Deadly Obsession in the Amazon (Vintage Departures) . I'm sorry that I finished it, because I didn't want it to end! Disclosure: I bought this book myself, and nobody asked me to write about it! 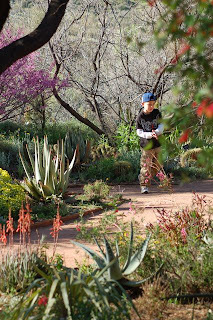 Last week, we visited the Desert Botanical Garden. It's been a while since we visited, and they have done tons of renovation! It's still a very beautiful garden, but it has become more and more manicured since we first visited 12+ years ago. 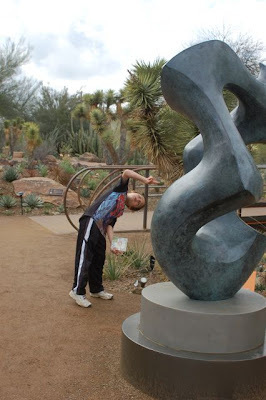 There are modern art sculptures throughout the garden, and all the kids had fun figuring out what each looked like. It was amusing, because each had their own ideas, and they were rarely even similar! This shot is of Nate trying to figure out this one. It made me laugh as he twisted and turned to find the best angle! 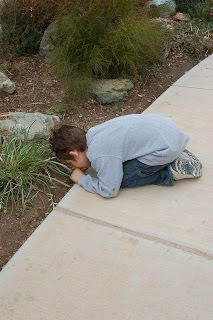 Did you play Wordless Wednesday yesterday? Then tell your story today at Tell Me Thursday! The boys have been diligently reading and keeping careful track of the books they've read towards their goal of raising money for Heifer International. They've been reading for just over 2 weeks. Colin has completed 15 books totaling 2,151 pages! He has read a a variety of Hardy Boys , Geronimo Stilton , Bailey School Kids and Pokemon books. He loves series and is excited to continue reading more in the Hardy Boys series. There's still time if you'd like to sponsor them to help them reach their goal of $160.00! Contact me directly if you'd like to help them out. Life is busy as usual, and I have little scribbles of post ideas all over! I decided to throw many of them into one post and cross it all off my to-do list! I had almost 24 hours to myself this weekend. Wow, do I crave the silence that I found during that time! 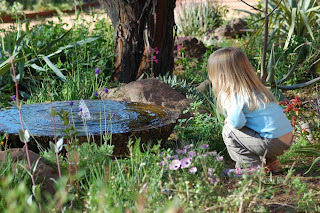 It's something that I know, but it's hard to find silence in a house full of children. The boys had planned on a camping trip, and I expected Lydia to stay with me. Instead, she insisted on going! It was close enough that I could retrieve her if necessary, but she's my little adventurer and played all afternoon and then slept in the tent with Daddy and her "bruvers." I took a long nap, went to dinner with my sister, and then went to bed early. It was wonderful, and I'm trying to figure out how to slide more silent times into my life. Soccer season is over! Many games were canceled due to rain, which was disappointing for Nate. Basketball doesn't start until June, so I have a couple months free from sports commitments. We've spent more time outdoors in the last couple weeks. 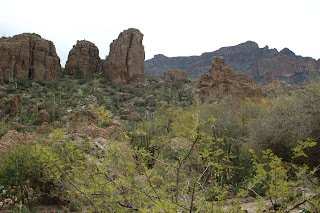 On a return trip to Boyce Thompson last week, Nate threw his arms around me at one point and said "Thank you so much for bringing me back here!" That boy loves to be outdoors. We transferred our wedding video to digital this week. We looked so young! It was fun to watch it, and I wish we would have done it sooner because the videotape definitely degraded in the last 12 years. The bottom 1/4 of the screen is nothing but static, but it was definitely a trip down memory lane to see ourselves and our family and friends on that day in the past. 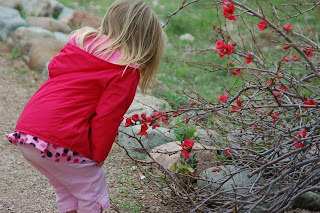 It's funny in how much I share here on the blog, yet so much of life is un-bloggable. I hope that readers realize that life is SO much more than the picture painted on this screen. Even those bloggers that appear to be train wrecks, I know that there are certain things that are off-limits for them as well. I have many more reviews to get through this month, so I hope everyone bears with me. I have a wonderful pile next to my desk of things I want to share -- but at the same time it seems a bit overwhelming. I've stopped accepting review items until I get caught up, so expect tons of product reviews in the short term. Last year, we had a blast at Disney on Ice! We're going again, and Feld Entertainment has generously provided me with a family pack of 4 tickets to give away to a metro Phoenix family!! You can purchase tickets for the show on April 1 - 4, 2010 at a discount with the code "MOM" Using that code at Ticketmaster.com will allow you to purchase 4 tickets for $44! (Additional tickets can be purchased for $11 each. Discount not valid on VIP or Front Row seating.) You can also receive that discount at the box office this year! Email me for the special discount flyer, print it out, and redeem it for the same deal at the box office! If you're local, and would like to enter the giveaway for 4 tickets, please leave a comment. You must be available on the evening of April 1, 2010 to attend the show at US Airways Center in Phoenix, AZ. I will use random.org to choose a winner on March 26, 2010! Google Docs is not working for me this morning, so we'll go back to the comment box for entries! Leave a comment and let me know your favorite Disney character. (If the comments aren't working for you, email me and I will add you to the giveaway manually!) Feel free to share this giveaway with others in the Phoenix area who might want to attend. Remember! You MUST be local, because the tickets are only good for the Phoenix show on April 1, 2010. Be sure to leave a valid email address so I can contact you! I will close and hide comments after the contest is over. Good Luck! I used the wonderful random.org to choose winners from all the comments left on the 3 giveaways I posted last week. Malaika is the winner for the Wanchai Ferry Great Night In giveaway! Yea!! Malaika used to think she couldn't enter my giveaways because she didn't live in Arizona! I let her know that my readers are all over the place, and the only restriction is usually that they have to live in the U.S. I think this is the first giveaway she entered, and she won! Tammy, who loves chocolate cupcakes, is the winner of the $20 Cinnabon gift card! And, finally, Rainbow Brite CD's are being sent to Melanie F, Valerie and Jennifer! Congratulations to all my winners, and thanks to everyone who entered! I'm sorry I didn't have enough to give you all a prize, but keep reading as I have more giveaways coming up! Do you like Tropicana Juice? We do, and I was excited to join their Tropicana Juicy Ambassador Program! This program allows you to earn reward points towards a variety of things, just from purchasing Tropicana juices and entering codes into the Juicy Rewards site. You can learn more and sometimes earn extra points by following Tropicana on Facebook and Twitter. You can visit Tropicana's Juicy Rewards site to find out what rewards are available in your area. It's quick and easy to register, and Mom Central and Tropicana would like to get you started with your first point! Over the next few months, I'll redeem my points and share with you our adventures. There are a variety of buy one / get one free offers available in my area, and I expect I'll use most of my points to visit local museums and other outings. 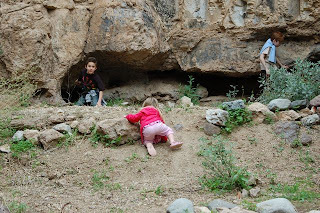 This shot is of Nate, exploring one of the caves at Boyce Thompson Arboretum. He had carefully swiped a stick around in there before sticking his head in -- a move which I thought showed some great insight! 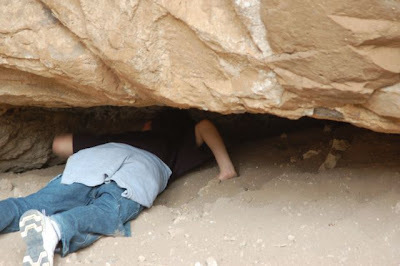 He didn't find anything interesting, but I wonder if I have a spelunker on my hands! I've loved cinnamon buns from Cinnabon for years. I hadn't had one in a while, though, and when I was recently contacted by Cinnabon I was surprised to hear that they now offer cupcakes! I picked some up during a recent trip to the mall and enjoyed them for dessert tonight. They were a hit in our house, and as soon as I brought them in the door, Lydia ran and got the book If You Give a Cat a Cupcake by Laura Numeroff for me to read. And, then she wanted me to add sprinkles to her cupcake (if you've read the book, you understand!) Even though we're currently out of sprinkles, she still enjoyed the cupcake very much. I'd love to share some with you! 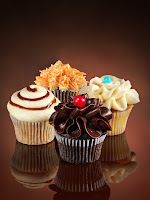 Let me know what your favorite cupcake flavor is and you'll be entered into a drawing for a $20 gift card to Cinnabon! I'll draw the winner next Tuesday (March 8, 2010) using random.org. Good Luck! Disclosure: I received a gift certificate from Cinnabon in order to sample the product. They also provided the gift certificate for the giveaway. Sometimes, you come across a piece of clothing so adorable and well-made that it makes you want to have more babies just to pass down the cuteness! 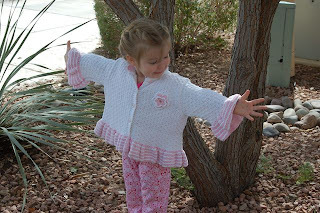 This sweater from June Bee Baby is an example. When I received this sweater, I was immediately blown away by how soft it was. Once I pulled it fully out of the packaging, I couldn't help but exclaim how adorable it was! I had read that the clothing from June Baby are handmade, and I began looking over the sweater. It is absolutely flawless! June (the owner) shared with me that every stitch is done by hand! It's like receiving a piece of clothing made by an extremely talented grandmother! 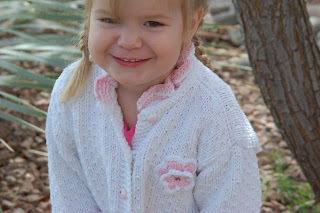 Whenever Lydia wears this Baby Blossoms sweater, I am always stopped and asked where I found such a sweet sweater. 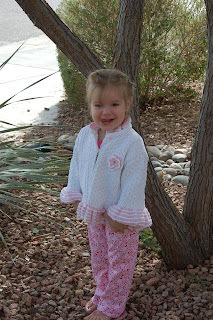 The sweater can be found at June Bee Baby, along with many other beautiful pieces for girls and boys. High quality, natural fibers are used on all pieces. Each piece is either hand-knit or crocheted from cotton, cashmere or wool. The weight of this sweater is perfect for our mild winters. You can see how much Lydia enjoys wearing this sweater, too! She loves the ruffles around the wrists and refers to them as her bracelets. I know my maternal grandmother would have loved crocheting for my daughter, and these pieces have the look and feel of that type of love. It is obvious that each piece is carefully created and expertly finished. I am thrilled that we were exposed to this site and I'm currently saving up to purchase one of the dresses for Easter! Would you like to order one of these gorgeous pieces? June has generously offered me a discount code for my readers that I'd like to share with you!